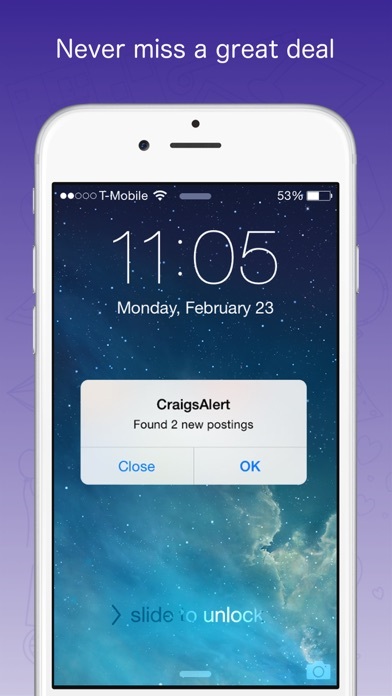 CraigsAlert 2 it is the only app capable to notify you within minutes after a new posting you are interested in shows up. No more need to spend any time checking for new postings! It also enables you to easily search postings with all the options you are used to, and for multiple locations at the same time. Browse posting details with images and contact the author from inside the app. Available for iPhone, iPad, and iPod Touch. ******************************** WHY USE CRAIGSALERT ******************************** * NEVER MISS A GREAT DEAL: this is the only app capable to send notifications minutes after postings appear! Create multiple alerts and let the app go to work and send you notifications shortly after new postings matching your search criteria show up. * MULTI-CITY SEARCH: set up your alert to search multiple cities at once. * SEE RESULTS AND CONTACT SELLER: browse postings and see search results for your alert, browse and zoom images, and directly call or send an email to contact the seller. * LOW BATTERY USAGE: this app does not need to turn on location services (GPS) to be able to keep searching while in the background. * OPTIONS YOU ARE FAMILIAR WITH: use all of the same filtering options you are familiar with in order to refine your search and create the perfect alert that will only notify you for postings you are really interested in. 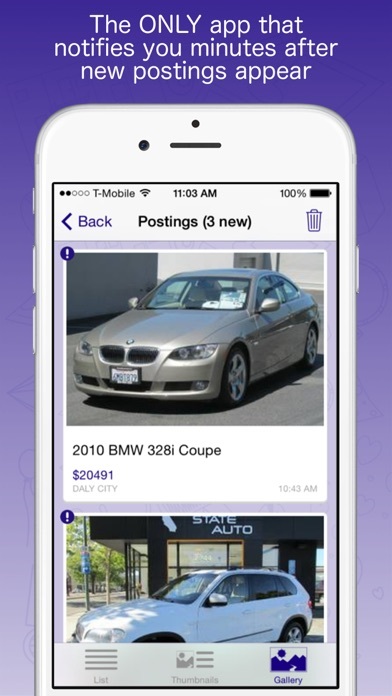 * SHARE THAT GREAT DEAL: easily share a posting via Facebook, Twitter, Message or Email. * FULL RESOLUTION IMAGES: zoom in on full resolution images with a pinch or double-tap. * CHECK FOR NEW POSTINGS ANY TIME: check any time with a simple downward swipe. * AD FREE: enjoy this app free of annoying ads. * AND MUCH MORE: - Mark any postings as favorites and easily find them later in a separate tab. - Sort your postings at any time. - Mark postings as read/unread with a single right swipe. 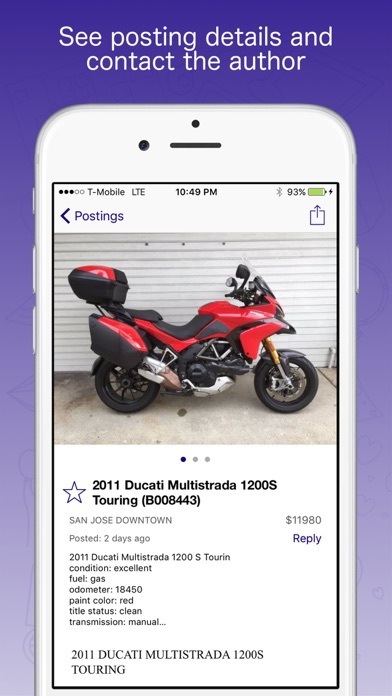 - Delete postings with a single left swipe. - Switch between gallery, thumbnails, and list view. - Automatically chooses the closest location on first time use. - Choose locations from a list ordered by distance to your current location. - Choose locations by browsing through a list of states and cities, anywhere in the USA and Canada. 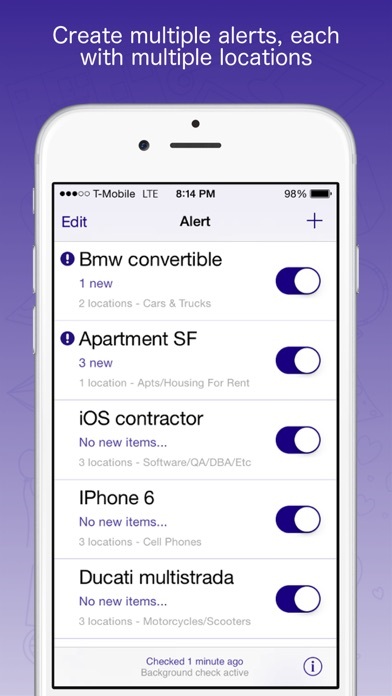 - Toggle alerts on and off. - Remembers your preferred settings for each category so creating new alerts becomes quicker. - Modify existing alerts at any time to refine search results. - Displays location of a posting on interactive map. - Choose neighborhoods (currently only for San Francisco Bay Area). - Reset all your filter settings with a single tap. ------------------------------------------------------------------- PREMIUM SUBSCRIPTION FEATURES: * Create up to 30 active alerts (1 in free version). Actual number of alerts is limited by a maximum of 30 locations (for example 30 alerts with 1 location each, or 3 alerts with 10 locations each). * Checks for new postings every 20 minutes (4 hours in free version). NOTE: The CraigsAlert premium subscription is optional. Extend your subscription at any time. A 7 day premium subscription will be automatically enabled on first use. When premium subscription expires you may continue using the free version. ------------------------------------------------------------------- TWO SUBSCRIPTION OPTIONS: * 30 days premium subscription for $2.99. * 1 year premium subscription for $19.99. Only problems are technical glitches from time to time and getting listings from areas you have not selected in your saved searches. Do buy the yearly alert option. I bought the yearly alert option and have yet to receive an alert. This app is really great!! It is simple to use and I receive my alerts instantly and already saved $$ on great deals! Other CL apps are way to complicated--too many taps to get from A to B. This app is very simple, fast and accurate. Well done! 5-stars. I've tried all the popular CraigsList apps and most of them Worked great With one problem, I kept missing the killer deals that Craig List is famous for. I'd see an ad for something really wanted and email or phone the seller, only to found out the item was either sold or someone else was coming round to see it before me, Aaargh! I only have so much time to scan Craig List, but to get good deals had to check every few hours or more to find What I wanted and ensure was the first person to call the seller. Then I found Craigs Alert. After Watching the short howto video had set an alert to notify me if any new ads for a Nissan Leaf Were posted. I Wanted a black 2011 model which had been hard to find and very popular. Later that day, my phone vibrated and dinged as Craigs Alert had found an ad for just the car I wanted. I called the ad and the seller was shocked as he had only just posted the ad and was not expecting a response so quickly. I drove the the dealer immediately and it was just what I wanted. I bought the car. Since then I have been using CraigsAlert to find me all sort of interesting items on CraigsList. If you make a living buying and selling items or need to find an apartment, this app is invaluable. CraigsAlert is easy to use, been trouble free and saved me a ton of time by finding the deals and letting me be the first person to call, Now I get to choose the best of CraigsList. Another company that puts out a craigslist app, allows you to spend your hard earned money on extra features, then creates a whole new version. They disabled the functionality of the old app forcing you to go to the new app. Now you have to spend your money again.